With the theme to the TV Anime “Ongaku shoujo”, Ogura Yui springs up with the promotional video “Eien shonen”. The anime follows titular unpopular idol unit in their quest for better things. Naturally, Ogura Yui operates as seiyu for one of the animated idols. 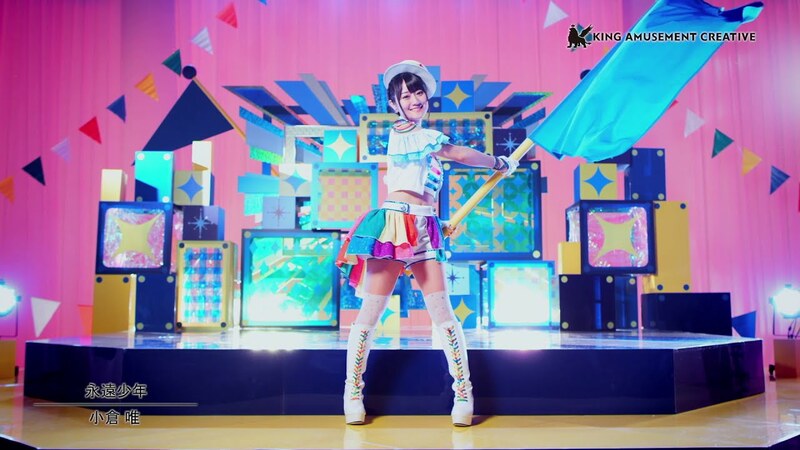 In the PV for “Eien shonen”, Yui presents to us a stage show meant to resemble a live performance complete with detailed stage decorations in shades of blue and yellow. Her audience surround her at 270 degrees while waving their towels rhythmically. Yui hits her adorers with a smoke cannon, plays some keyboards, and waves around a guitar spectacularly. While this style of PV isn’t particularly spectacular in concept, I can always make an excuse just to put the vibrantly cute Ogura Yui on my television screen for a few minutes. “Eien shonen” rests on the back on the charisma and talent of its star, and that’s enough of a sale for me. Ogura Yui’s 9th single takes center stage on July 25, 2018. New PV Alert: Ogura Yui – Enjoy!